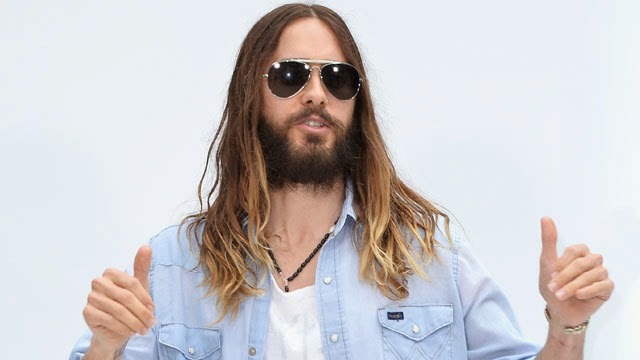 Jared Leto, Oscar winner and part-time resident of Centaurus A, recently told Ryan Seacrest that he plans to hitchhike across America in support of the new album – predictably titled “America” – by his band 30 Seconds to Mars. “I may jump on a donkey in the Grand Canyon or take a hot air balloon,” he explained. And then he concluded, twice for good measure: “I got the gear. I got the gear.” Perhaps, but how much gear? After all, minimal follow-up indicates his quest is only scheduled to last a week, which really undercuts any notion of authenticity, not that such a notion existed in the first place. I imagine this is mostly an Instagram stunt. Still, when this blog sees a headline like Jared Leto is hitchhiking across America, how on Earth are we not supposed to take it and run with it and imagine the Jared Leo Hitchhikes Across America movie? The question, of course, then becomes who does Jared Leto encounter in this movie while hitchhiking? We have some thoughts. Tiffany Haddish. I have no idea what to pitch here. I just want to put Haddish in a car, have her pick up Leto, and then let her improvise everything else. Charles Grodin. If Leto really wants to take a hot air balloon ride then why not make Grodin the curmudgeonly hot air balloon pilot who reluctantly gives Leto a ride and then, upon realizing his drastic error mid-flight as his lone passenger espouses about the finer points of celebrity astrology, deliberately tries to crash the hot air balloon simply to escape. Richard Jenkins. Somewhere in rural America, Leto happens upon a once successful business executive, played by Richard Jenkins, who was laid off and has since gone broke, living out of his car. Eventually, the business executive stops for the night at a shantytown, where the two men sit around a campfire with other newly homeless ex-business execs. Leto explains he once killed a snake with his bare hands to fashion his snakeskin jacket from scratch. Jenkins’s ex-business exec asks Leto to leave. Forest Whitaker. Upon discovering that Leto fronts a band, Whitaker’s character, a retired session guitarist, squires Leto to a Chicago blues club. The house band explains Leto can’t leave unless he sings the blues. Leto, it turns out, cannot sing the blues. Finally, at 4 AM, after several hours of trying to sing them and failing, Leto escapes through a bathroom window. Tilda Swinton. Like the eponymous John L. Sullivan of “Sullivan’s Travels”, Swinton, playing herself, has taken to the road to see how it feels to be in trouble. When she picks up Leto, she steers the two of them headlong into danger, the kind they both only thought existed in movies. She loves it; he hates it. Desperate, he sends out an SOS via Instagram. Jennifer Jason Leigh, Connie Britton, Rashida Jones, Kirsten Dunst, Tessa Thompson, Marcia Gay Harden, Téa Leoni, Debi Mazar, Gillian Jacobs, Lake Bell, Anna Kendrick, Eva Mendes, Mary Steenburgen. At various intervals, each of these actresses, playing nameless characters, pass Leto on the highway and decline to pick him up.